There are various ways for you to be involved here in the Mustangs Youth Services Center. Can you spare a few hours? 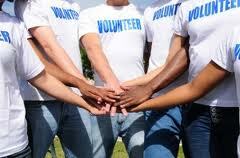 We are always looking for volunteers to help represent the center in various ways during school and after school. If you are interested in volunteering your time and efforts, please visit the Live United link below and fill out the form to have your information submitted to us. We greatly appreciate your willingness to serve in the Mustangs Youth Services Center. We look forward to having you as part of our team! The Center is always accepting In-Kind Donations to serve the needs of the students. We accept clothing, hygiene items (shampoo, soap, toothbrushes/toothpaste, deodorant, etc…) shoes, coats, schools supplies, monetary donations and any other items that would assist in filling basic needs. Items can be dropped off at the Youth Services Center during our office hours. All donations will be used toward student achievement and are tax deductible. Community agencies, businesses, organizations and churches are always welcome to be apart of student achievement at McCracken County High School. From classroom presentations to career mentorship we welcome the opportunity to collaborate with YOU!! Please contact us about how YOU can help make a difference in the lives of our students! If you would like to learn more about the Mustangs Youth Services Center, click here for a copy of our brochure.